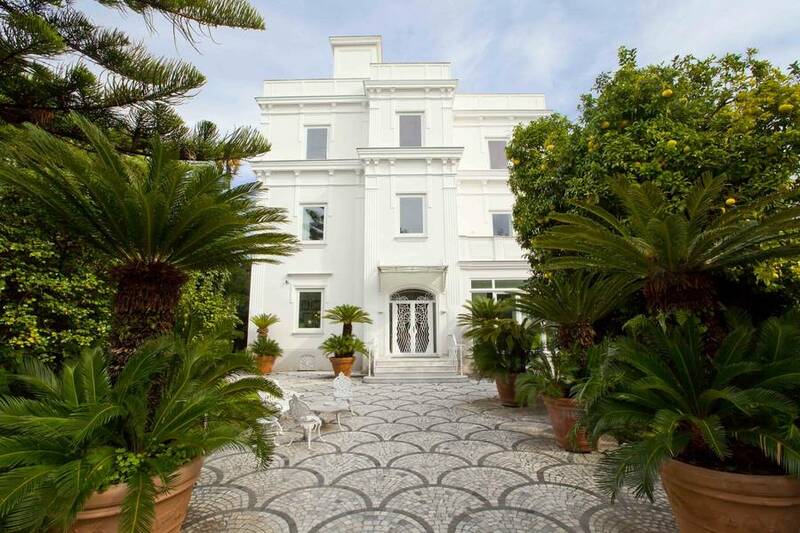 A historic, Art Nouveau-style villa, an elegant garden with a pool surrounded by the coast's famed citrus and palm trees, charming yet contemporary guest rooms, and warm Sorrento hospitality: this is what you can expect upon arrival at Villa dei D'Armiento, a unique luxury villa that will win over any traveller to Italy's resort town of Sorrento. 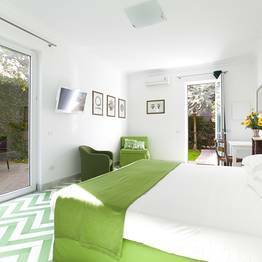 The first detail that will captivate you in your room at the Villa dei D'Armiento is the understated, elegant atmosphere made up of a thousand small, yet impeccable, touches. 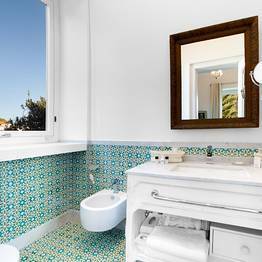 A welcoming armchair, a stately artwork, a soft light, a vintage decoration: a mosaic of tiny comforts that add up to a masterpiece of hospitality. 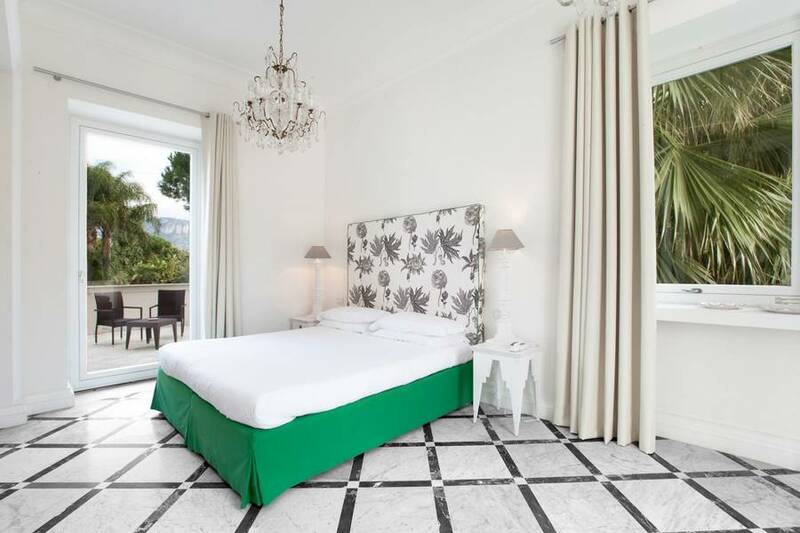 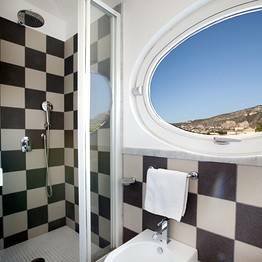 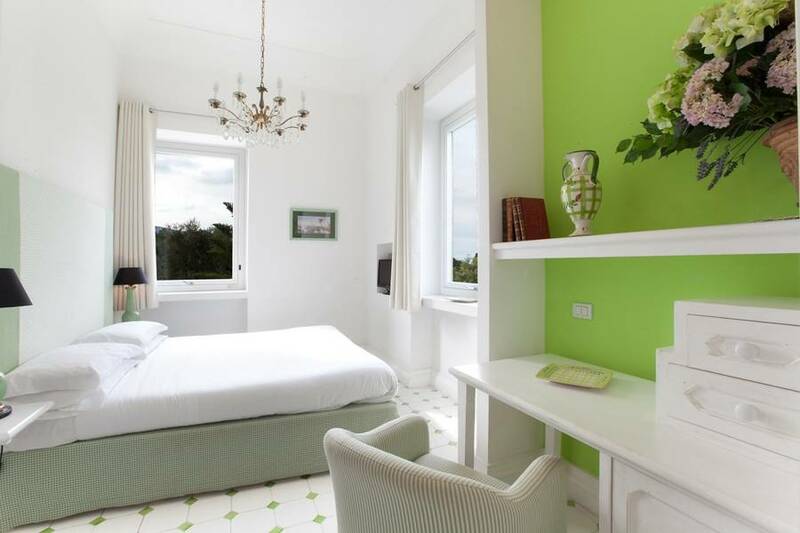 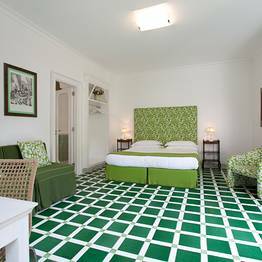 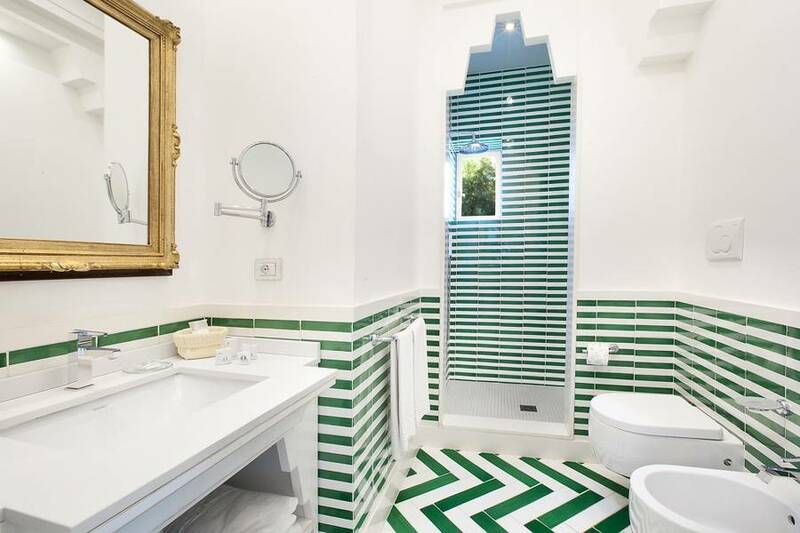 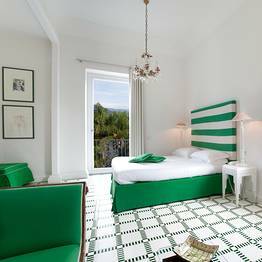 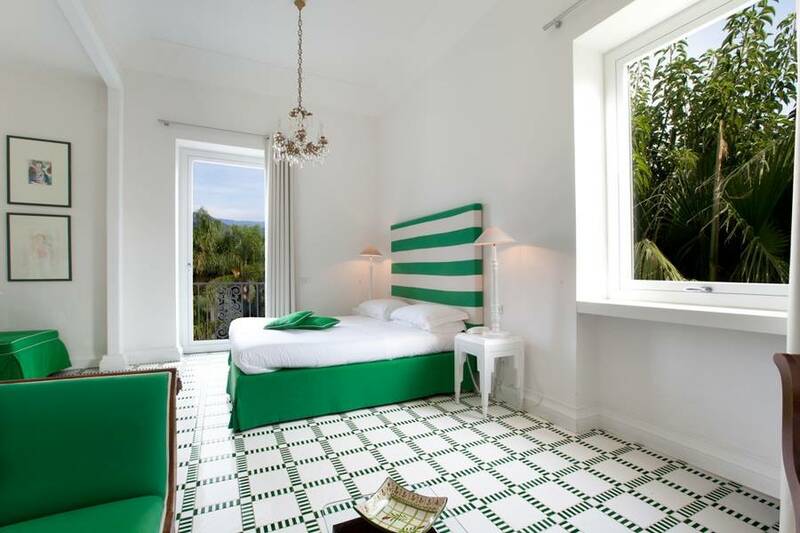 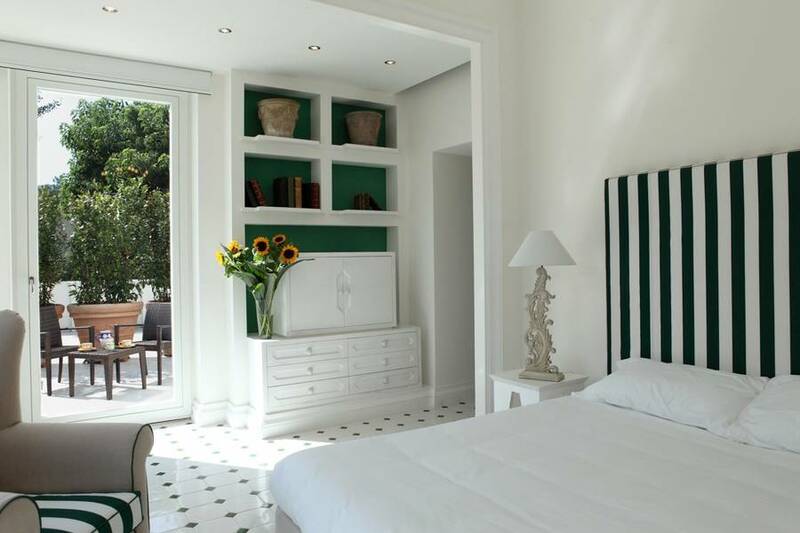 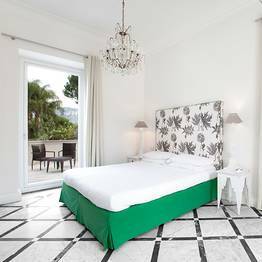 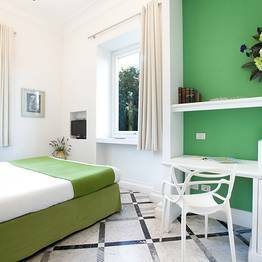 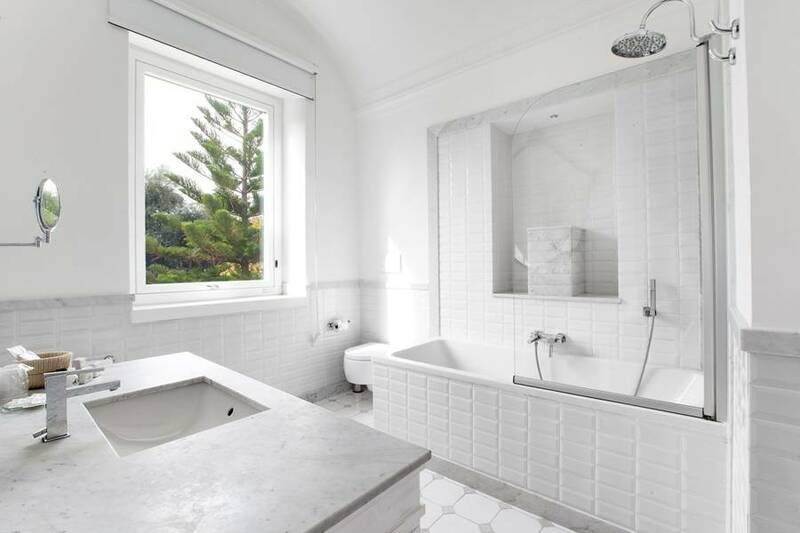 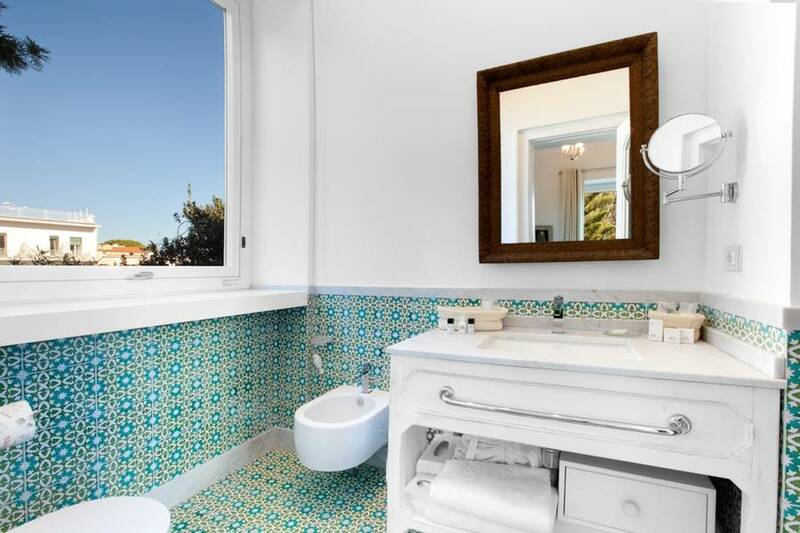 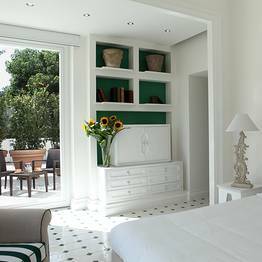 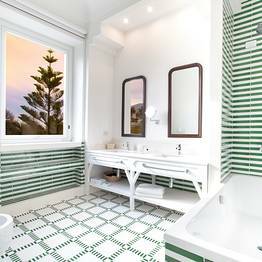 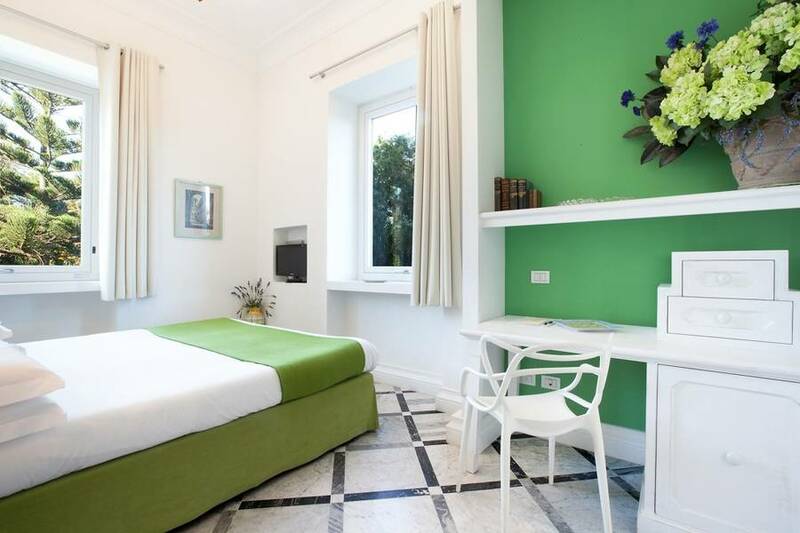 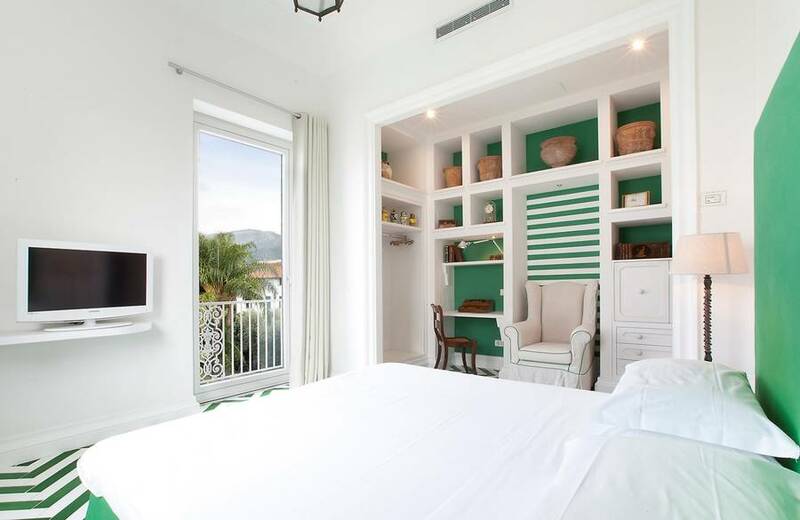 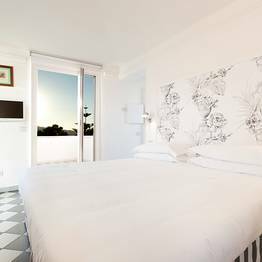 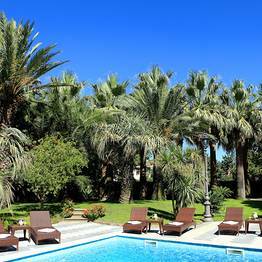 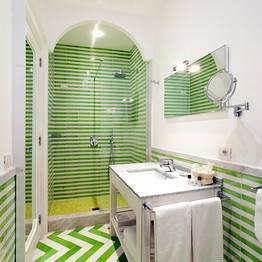 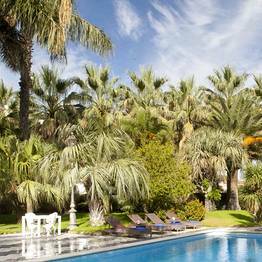 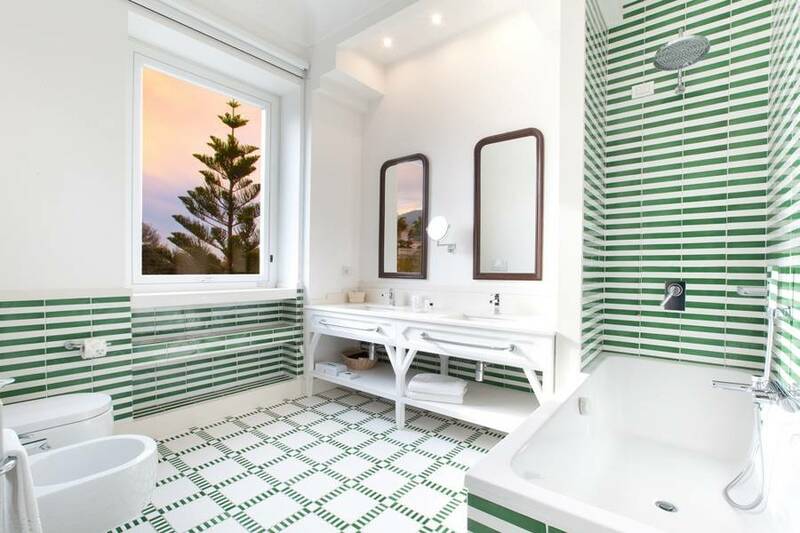 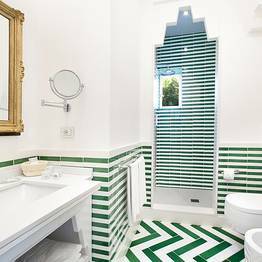 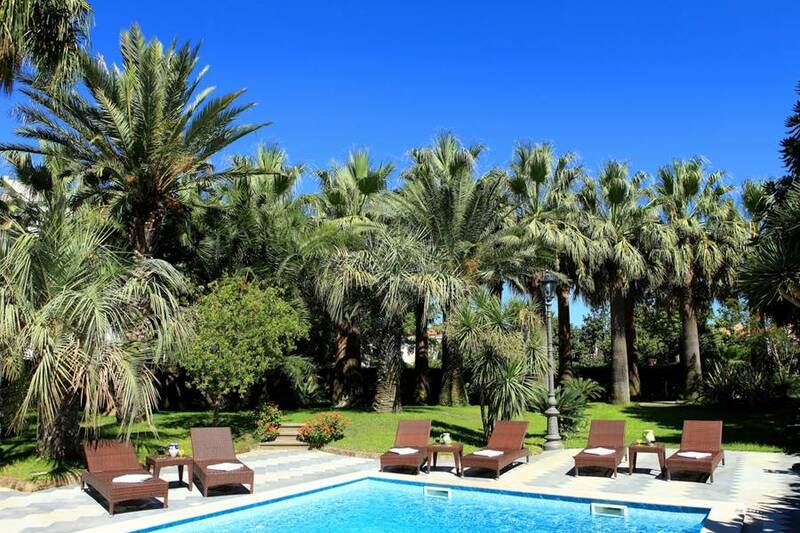 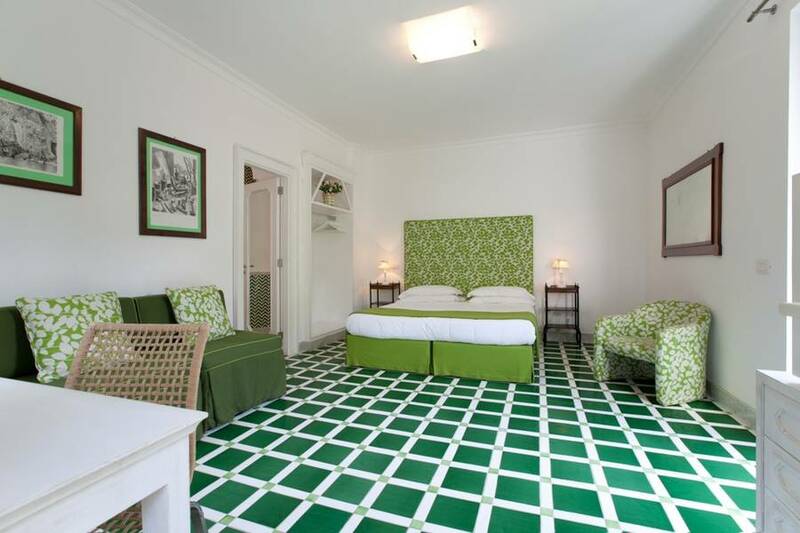 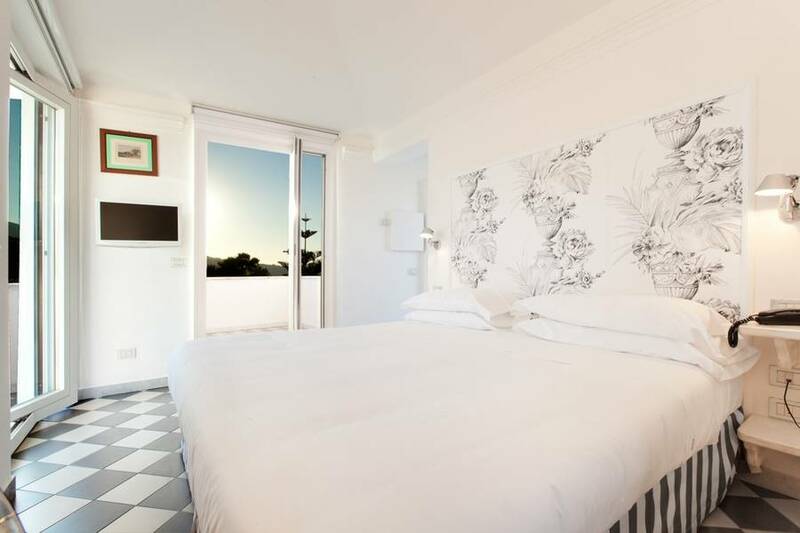 Rooms come fully equipped with air conditioning, wifi, minibar, and flat screen tvs...in addition to comfortable latex mattresses for a perfect night's sleep, and bright bathrooms decorated with traditional majolica tiles to begin your day in Mediterranean style. 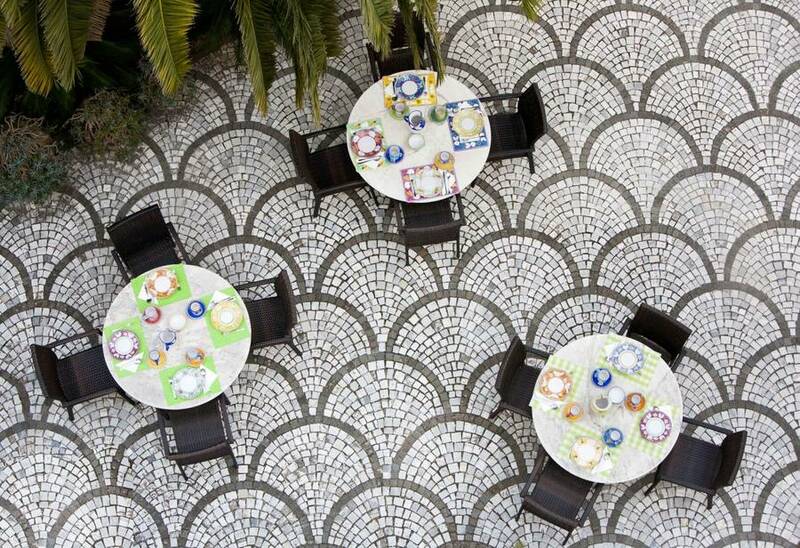 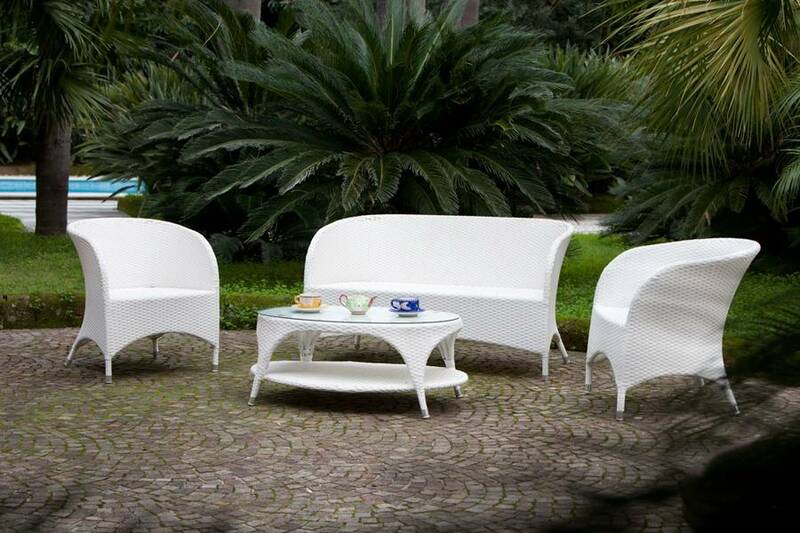 The Terrace Room is a wonderful option for guests who spend most of their time relaxing outdoors. 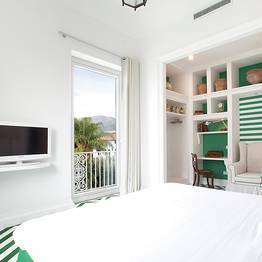 Though the indoor space is the smallest at Villa dei D'Armiento, the sweeping 100 square meters of private terrace is made for unwinding under the warm Italian sun, as the breeze comes in off the sea. 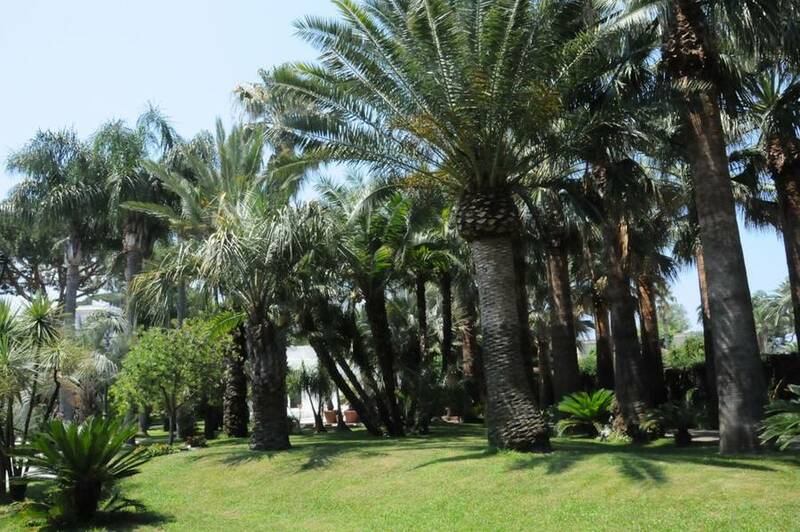 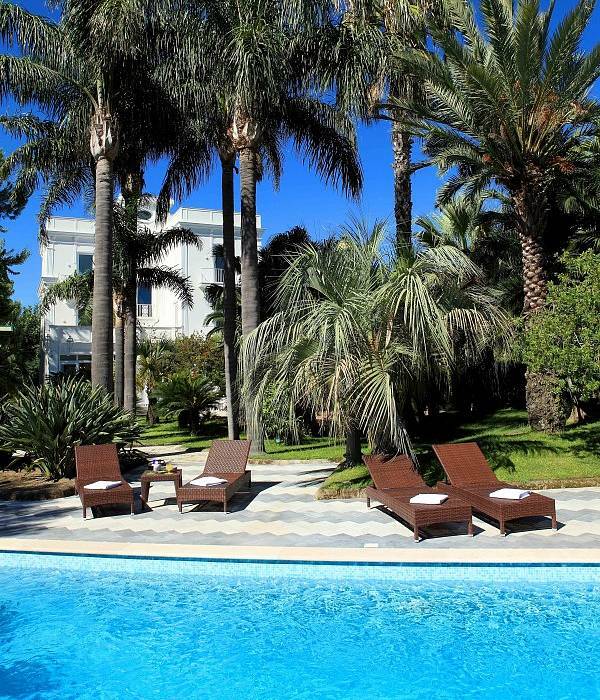 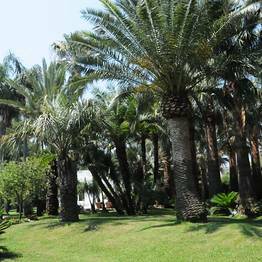 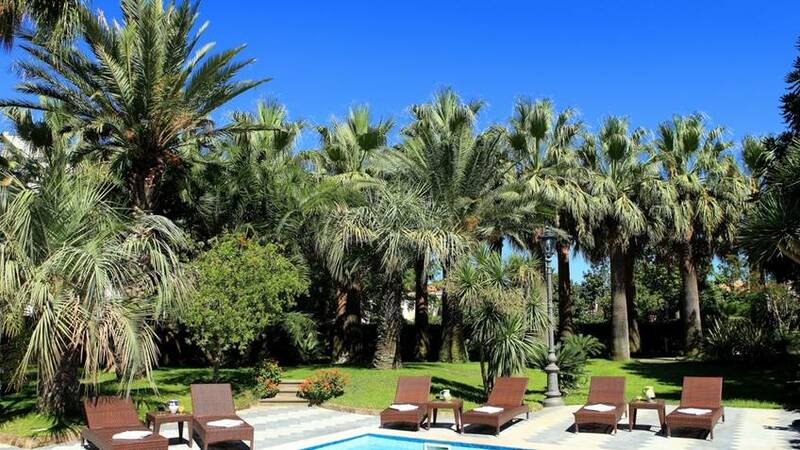 The lush garden at Villa dei D'Armiento is a heady mix of Mediterranean scents and colors, stretching over 400 square meters of palm trees mixed with Sorrento's local orange and lemon trees. 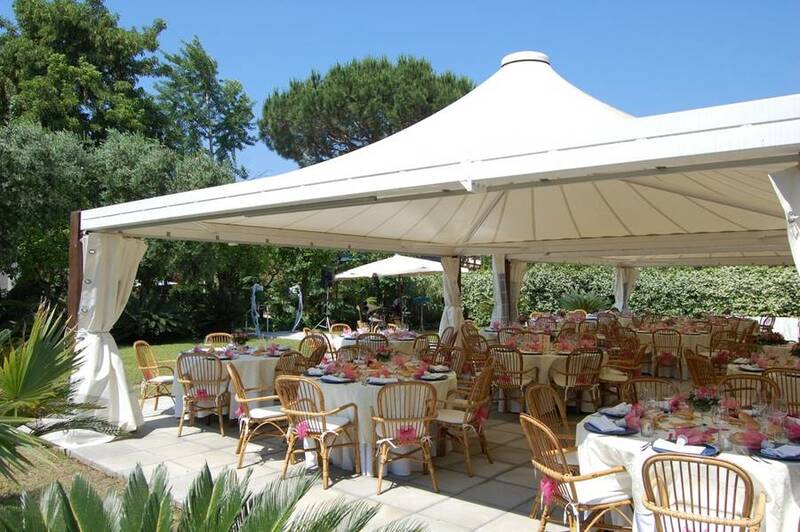 Tucked beneath this shady canopy, the pool and sundeck, furnished with comfortable sun loungers, and the open air hot tub are perfect for relaxing after a day of exploring Sorrento, or for spending a leisurely afternoon. 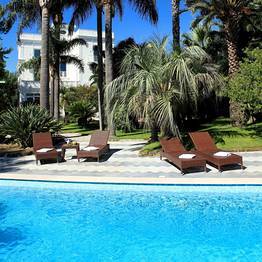 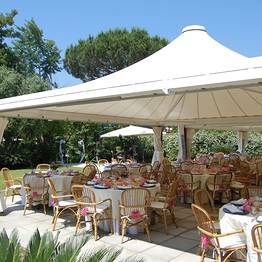 For guests who want to spend time on the beach, the Sant'Agnello beach is just 50 meters from the villa. 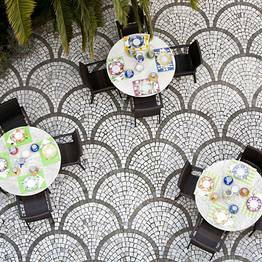 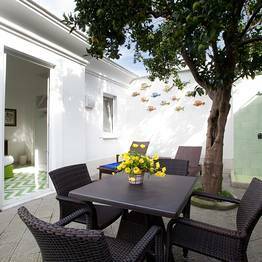 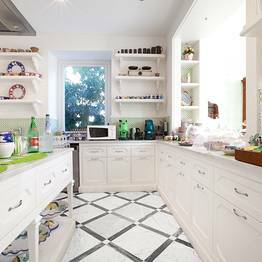 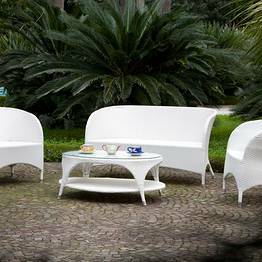 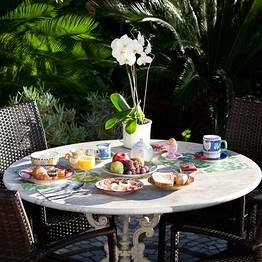 Fresh, hot coffee, local oranges from Sorrento, homemade cakes and traditional sweets: guests can choose from this and more each morning in the dining room or outdoors in the garden. 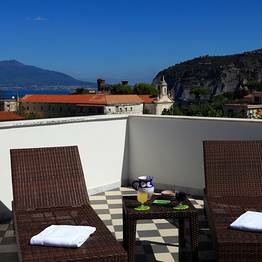 Guests can also order snacks poolside, or linger over a cocktail at sunset on the large panoramic terrace overlooking the Bay of Naples. 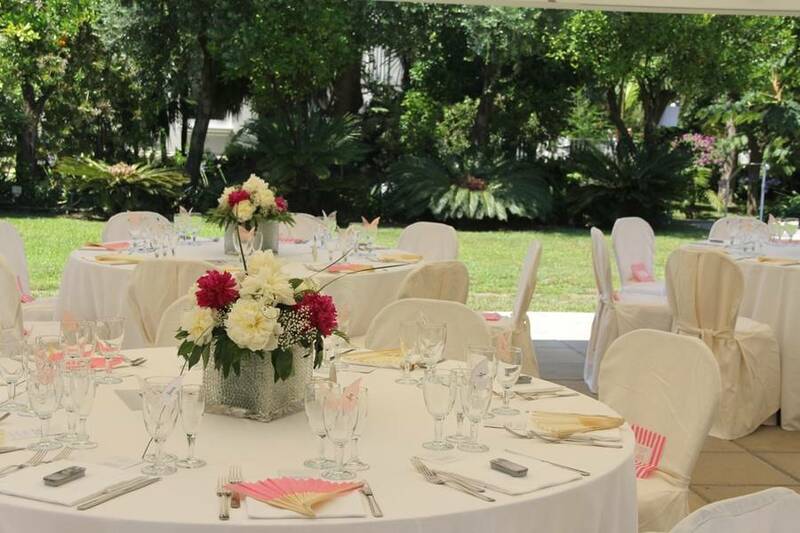 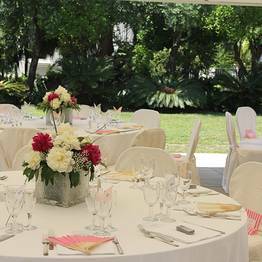 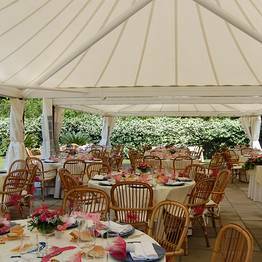 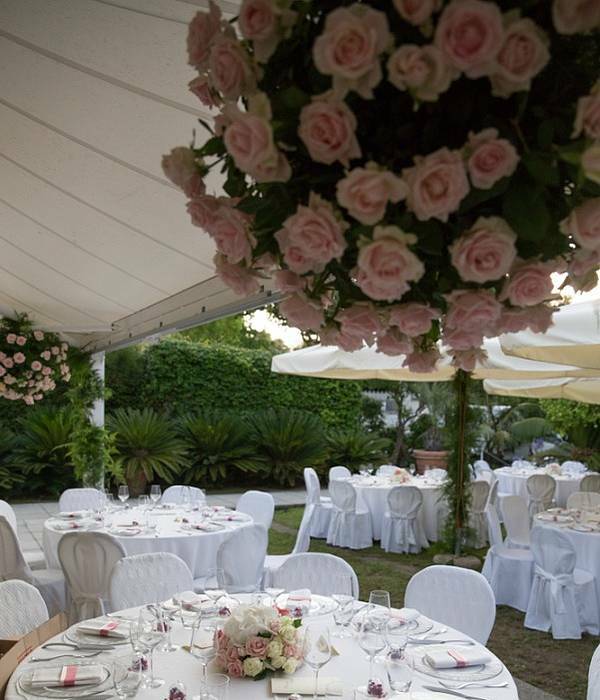 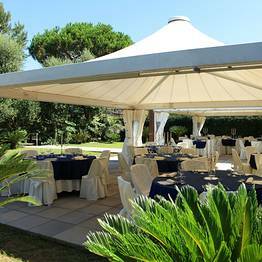 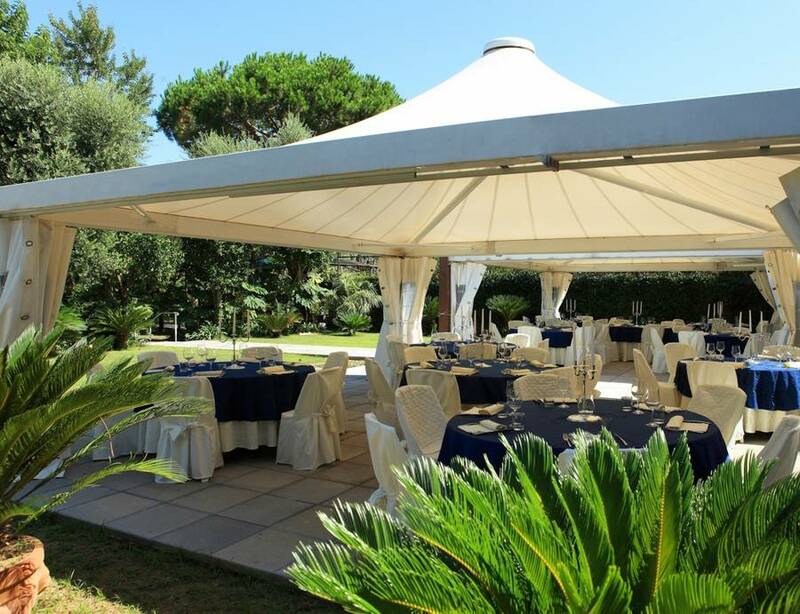 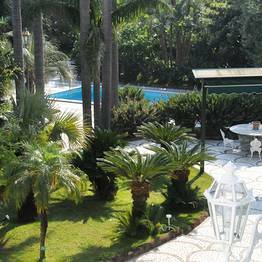 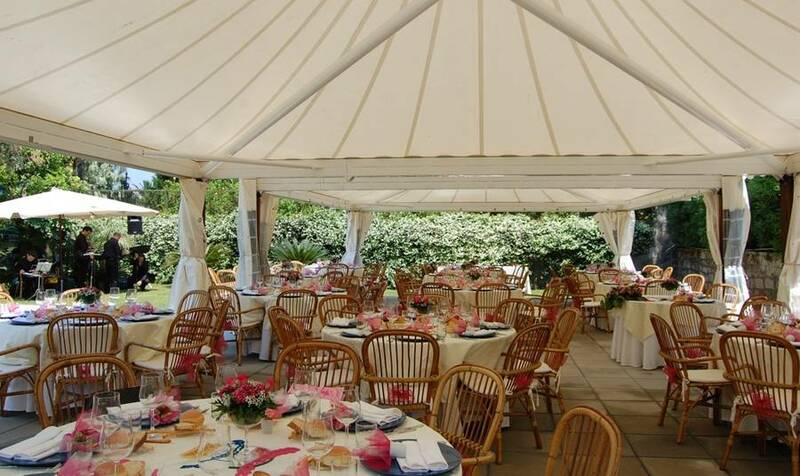 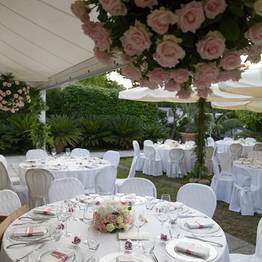 If you are planning a destination wedding in Sorrento, the garden at Villa dei D'Armiento is the perfect venue for wedding receptions and banquets or private parties to celebrate any special event. 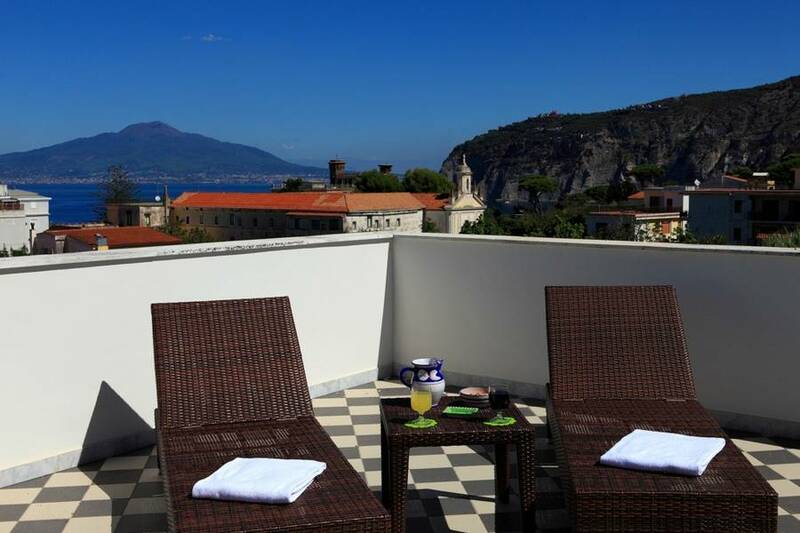 Sant'Agnello is a small town on the Sorrentine Peninsula, close to the famous seaside town of Sorrento. 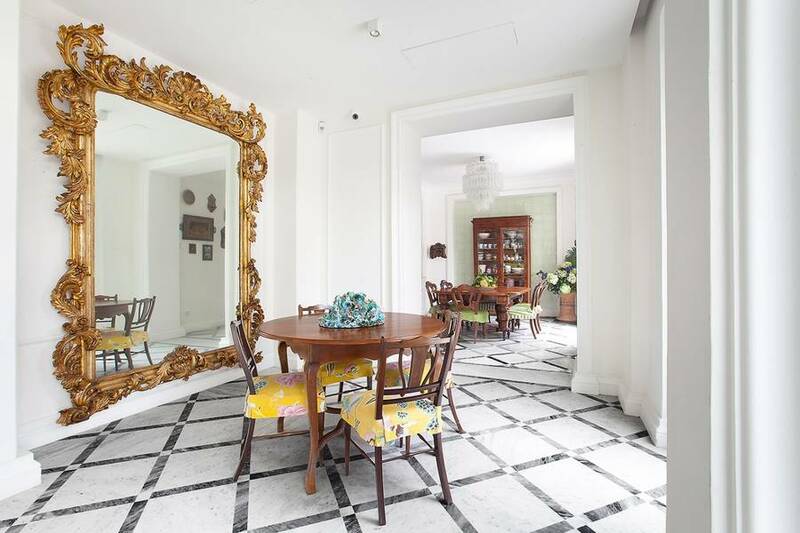 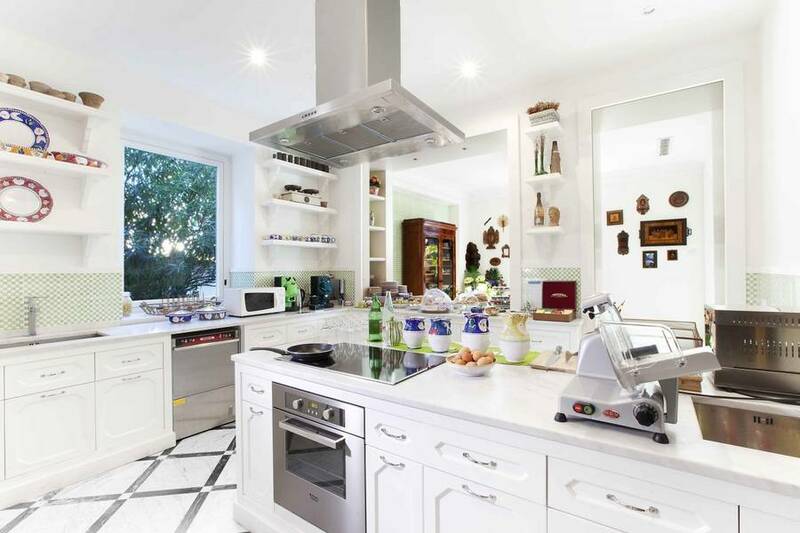 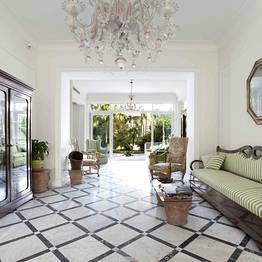 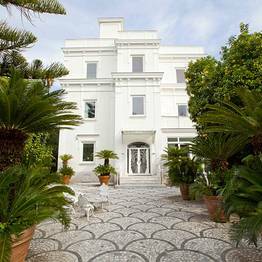 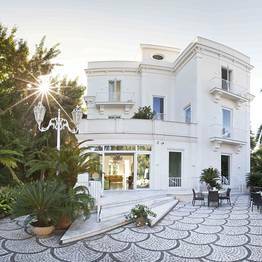 Here, a mere 50meters from the sea and enjoying magnificent views of the Bay of Naples and Mount Vesuvius, lies Villa dei D'Armiento: a prestigious Italian Liberty style residence, recently transformed in to an elegant and exclusive villa. 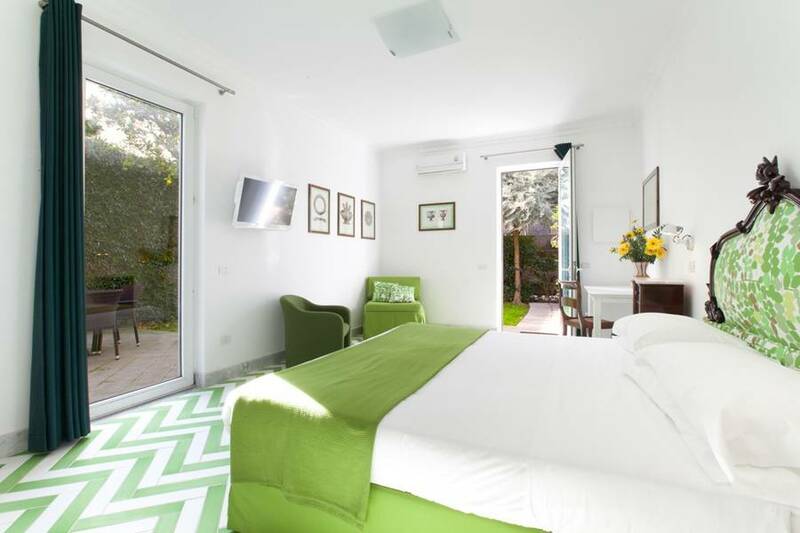 Perfectly located for those seeking a peaceful destination within easy reach of all of the most famous sites of the Sorrentine Peninsula and the Amalfi Coast, Villa dei D'Armiento is just a few minutes away from Sorrento, and within easy reach of Vico Equense, Pompei, Herculaneum, Amalfi, Positano, and Ravello. 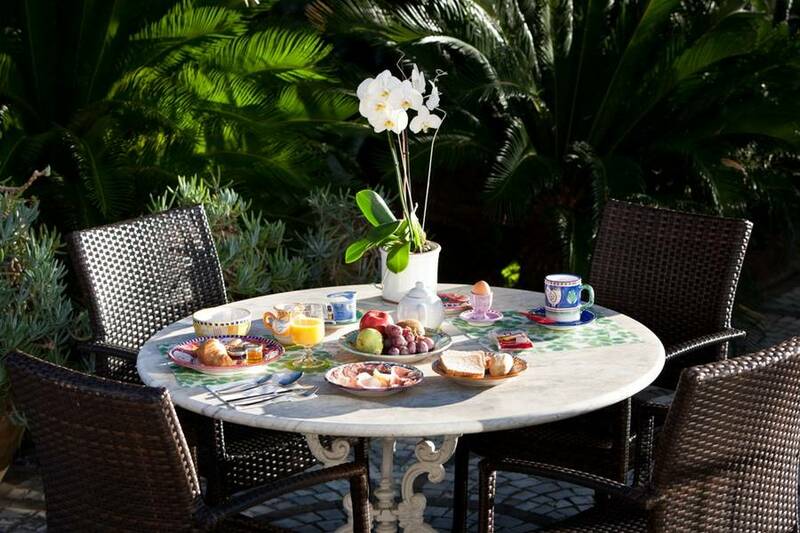 Naples and the island of Capri are favorite day excursions. 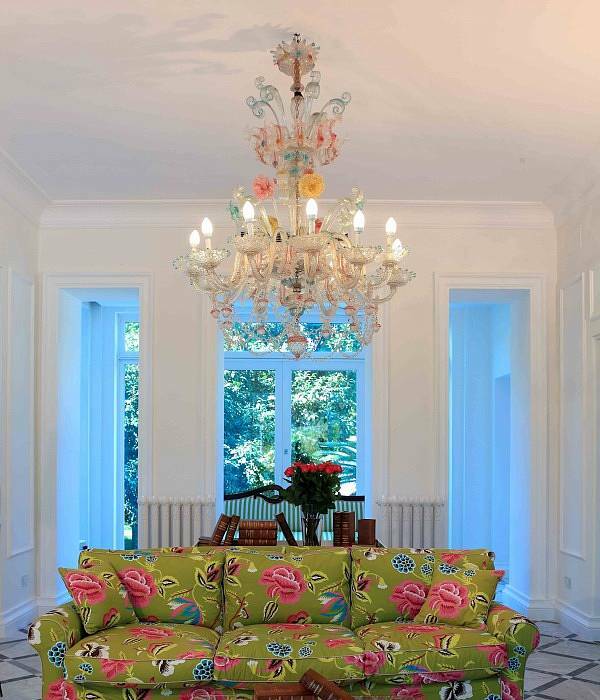 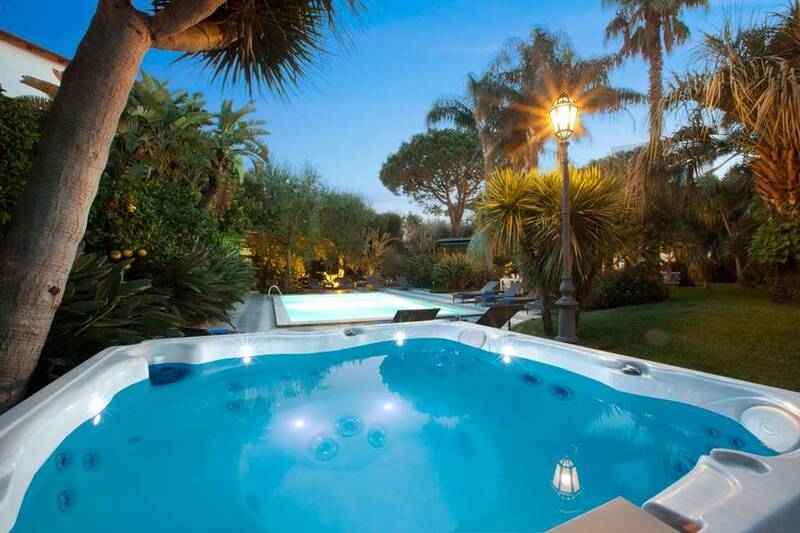 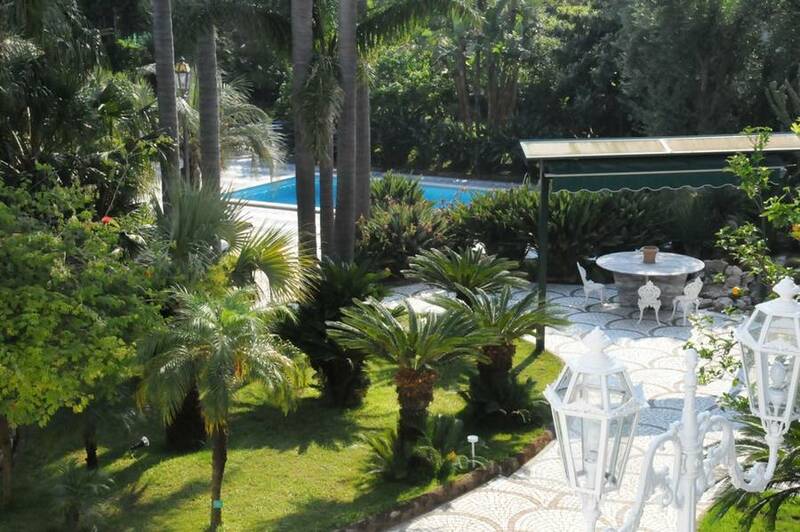 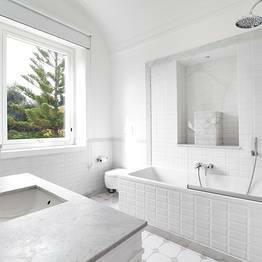 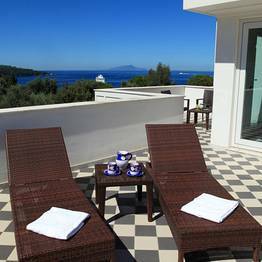 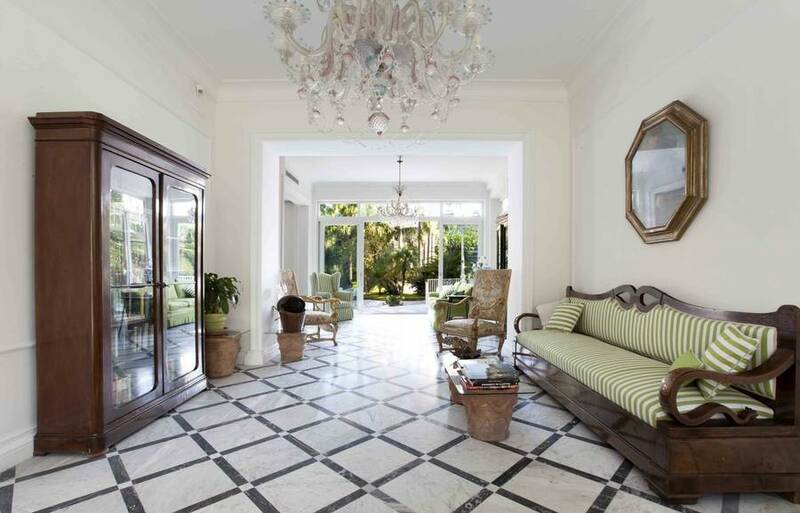 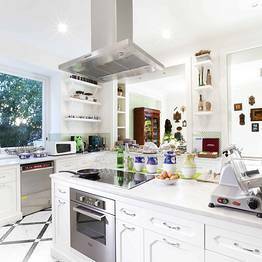 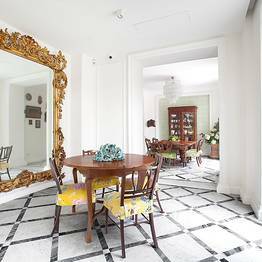 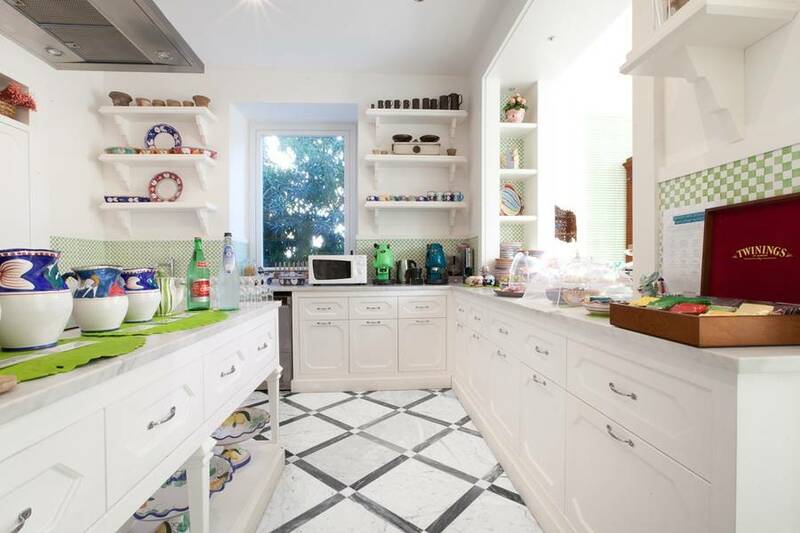 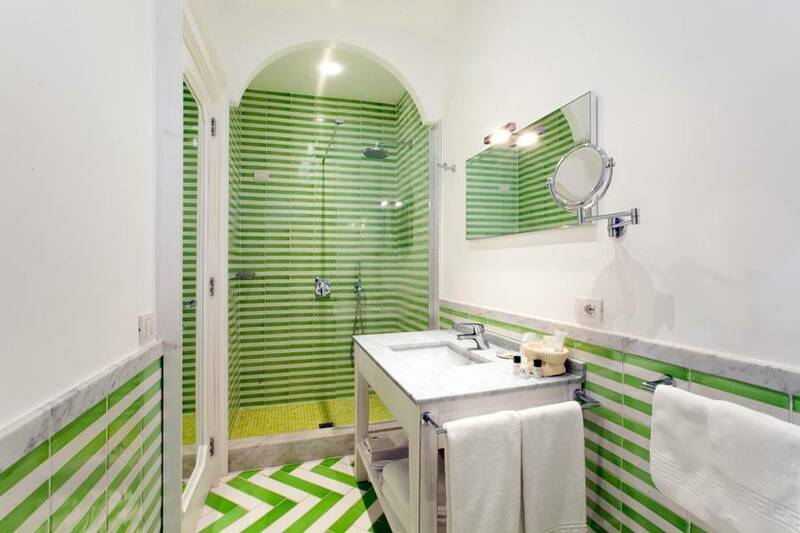 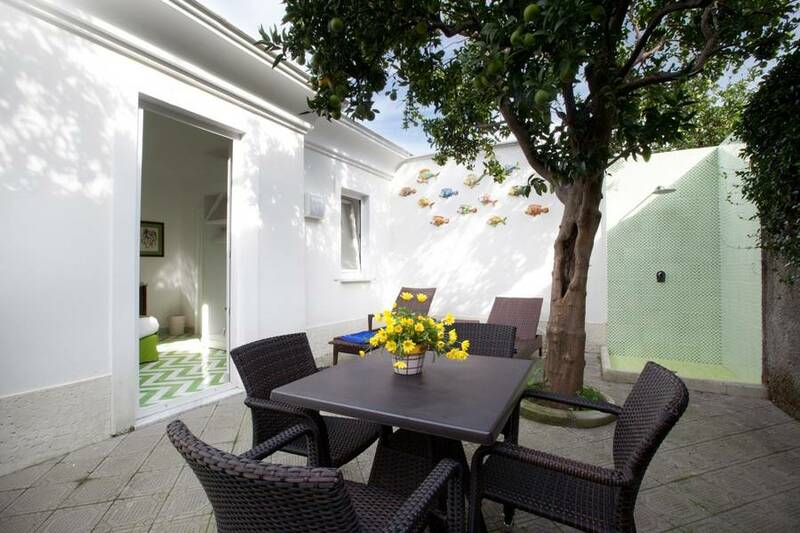 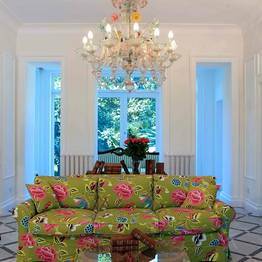 Book Villa dei D'Armiento on SorrentoInsider now with no additional booking fees.